Is Following One Of The Four Madhabs Necessary? 2. The four Imams lived in an age that was described by the Prophet (pbuh) as the most blessed of Islamic ages. He (pbuh) said: The best of my Umma are those of my generation, then the (generation) that follows them and then the (generation) that follows them (Sahih al-Bukhari). Obviously, I cannot claim to have this distinguished credential. 8. Other schools were never meticulously codified and refined as were the opinions of the four Imams. 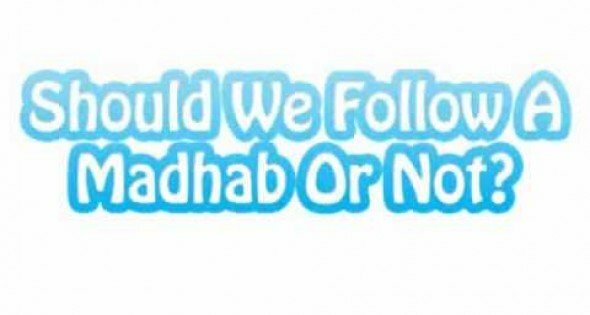 Thus it is a red herring to say why only follow these four and not the madhab of say, Thawri or Tabari etc. 9. If Salafism was the way of this Umma throughout its history, why would Sunni scholars continuously condemn it as a dangerous deviation? For example, the great scholar Ibn Rajab (d. 795 AH) wrote a book against them called: Refutation Of Those Who Follow Other Than The Four Schools (Ar-radd `ala man ittaba ghayr al-madhahib al-arba`a). We all love to be given a choice. Having a range of hats or shirts to choose from is a luxury. But it would be suicide if we brought this mentality of the marketplace into our religion. When a person says it is not obligatory for the Muslim to follow one of the established schools that is what he is doing. People are then free to shop for whatever opinion takes their fancy! This is termed making your desires into religion and it is forbidden by this verse: Have you seen the one who takes his desires as his god (45:23). If the millions and billions of Muslims were supposed to apply their minds to the verses and hadith, chaos would only result. Without the scholarly expertise (or a high level of fear of Allah ta`ala) they would make horrendous mistakes. One of the legacies of the four Imams was their accurate use of analogy. That is deducting new rulings where nothing is clearly mentioned. These master scholars expended their intellects on precisely discovering the basic reason behind a ruling (`illa). If that reason is found elsewhere, they concluded, the same ruling would apply. And likewise if it is absent in another context then the ruling does not apply. For instance, many of the intoxicants and drugs that exist today were not mentioned in revelation. Nevertheless, the Islamic jurists explained, because the basic reason behind the forbidding of alcohol was intoxication, logically these other substances must also be considered forbidden by Allah Almighty. But the Salafi/“ahle-Hadith” campaign to get rid of the schools and their rules, would have individuals (and we are witnessing it happening more and more frequently today) turning to the verses and hadith and arguing,-for example- “I think the reason why ablution (wudhu) was made necessary before prayers was due to the extreme heat people lived in back in those days. In our age we have air conditioners, deodorants etc. Thus since the original reason does not exist anymore, wudhu is no longer necessary” (!) Take another example: “The reason Islam forbade having boyfriends and girlfriends was because of the danger of children being born without there being anything to bind the father to take responsibility. Today, effective contraception is easily available and DNA testing ensures no father can deny his child, thus this fear is now fully taken care of. So Muslims should also embrace the culture of men and women freely mixing and dating.” If the regulation provided by the four schools is thrown away, how do you stop the many individuals that form part of the Umma, who are weak of iman and taqwa, from turning Islam into a carnival of desires? This horror story is the ultimate end of the simplistic call of Salafism. It is this same call that has tragically even led to individuals perpetrating mass-murder on the streets of many cities in the name of Islam! Rather, it is nothing but a subversion and mockery of Islam. The far-sighted scholars of the Ahl al-Sunna long ago understood how valuable these four schools were in safeguarding the Deen of Allah Almighty. So they issued a fatwa that it was necessary for every Muslim to learn and adhere to one of the four schools. The Hanbali scholar Imam ‘Ala al-Din al-Mardawi in his major Juristic compendium Al-Insaf, cites the statement of the famous scholar Imam Al-Wazir ibn Hubaira (died 560 ah):“Consensus has been established upon taqlīd of every one of the Four Schools and that the truth does not lie outside of them.” (Vol.11 p.169, Dar al-Kutub al-‘Ilmiyyah). Imam Rajab al-Hanbali writes in his book: “Refutation of anyone who follows other than the four schools” [A title that emphatically exposes the deception of the Salafi claim that it is they who represent true Islam]:“…that is the Mujtahid, assuming his existence, his duty (Farduhu) is to follow what becomes apparent to him of the Truth. As for the non-Mujtahid his duty is taqlīd.” Elsewhere having indicated in the latter the rarity of the lofty status of ijtihād, he states: “As for all other people who have not reached this level (of ijtihād), it is not allowed (lā yasau‘hu) for them but to do taqlīd of these Four Imams and to submit to that which the rest of the Ummah submitted to.” (Majmoo‘ al-Rasail Ibn Rajab, vol.2 p. 626 and p.624 respectively). In the famous commentary of the treatise of Imam Ibn Abi Zayd al-Qayrawani Al-Risalah, entitled “Al-Fawākih al-Dawāni,” Imam Ahmad al-Nafrawi (died 1126 ah) also confirms the Ijma of all the scholars that following one Imam is obligatory: “The consensus of the Muslims has been established upon the obligation (Wujub) of following one of the four Imams today; Abu Ḥanīfa, Malik, Shafi and Ahmad- May Allah be pleased with them… What we explained before, in terms of the obligation of following one of the four Imams, is in relation to those who do not possess the capability of performing ijtihād.” (vol.2 p.574, Bab Fi al-Ruyah wa al-Tathāub, 1997). This is a book by Shaykh Abu Usamah from South Africa. It covers several major unfounded doubts in the minds of many concerning the issues of following a madhhab (School of Islamic Law). The book is in question and answer format which makes it easier to comprehend. A lot of the discussions have been adapted from “Atharul Hadith” of Shaykh Muhammad ‘Awwamah (may Allah protect him) which has been extremely successful in eradicating many contemporary misconceptions. In the past, our system of information was in line with the ancient methods; that is to acquire Islamic knowledge from heart to heart. This was done in madrasahs as well as via the mimbars of the masajid. Now that the world has become a global village, the channel of education has been broadened. Just as this brings some benefit, it also has its hazards. As a result, we have become beset with fitnahs of all kinds. One such trial is the scourge of salafism; a doctrine or ideology that deceitfully claims to uphold the teachings of the salaf, but in reality actually defames the very same thing!! A consequence of this is that people begin to question the legality of other madhahib. In our province, the overwhelming majority are Hanafis. Therefore the attack of these ill-informed individuals would be focused on the Hanafi Madhab. The purpose of this booklet; entitled: ‘From Our Perspective’ is to enlighten one and all about the authentic proofs that support the Hanafi standpoint on issues that these individuals raise objection to. The book is meant to be brief, and therefore most of the chapters have just one clear authentic proof. For more elaboration on such issues, the ‘Ulama can refer to the detailed Arabic works on this subject. The following work is an English translation of a treatise known as al-Din al-Qayyim by Shaykh Habib Ahmad al-Kiranawi of India, it was originally written in Arabic as a riposte to Ibn Qayyim al-Jawziyya (d. 751 AH) of Damascus, on the latter’s treatment and claims on the issue of Taqlid. Thus, it is esentially a scholarly defence of the need and permissibility of following qualified scholarship (Taqlid) of the highest ranking Imams known as Mujtahids, like Abu Hanifa (d. 150 AH), Malik ibn Anas (d. 179 AH), al-Shafi’i (d. 204 AH) and Ibn Hanbal (d. 241 AH). These Imams are the founders of the four most accepted schools of Islamic jurisprudence (Madhhabs) in Sunni Islam for more than 1200 years. Their schools represent the real understanding of the teachings of the earliest Muslims, meaning, the Way of the Sahaba, and what they received from the Companionship of Allah’s Messenger, sallallahu alaihi wa sallam. Till this day, most Muslim scholars and laiety on the surface of the earth are adherents of one of these four recognised Madhhabs. It is only a small minority who have distanced themselves from Taqlid via the centuries as the books of Islamic scholarship and history attest to for more than a millenium. The English edition was translated from Arabic by Shaykh Zameelur Rahman from England, and with his permission it has been uploaded here for the benefit of all readers who wish to understand the issue of Taqlid, and why it is necessary for most Muslims to practice Islam in their lives with the conviction that it is based on not only the sources of the Sharia, but explained and detailed accurately by premier authorities known as Mujtahid Imams.